Kent Twitchell’s Morphesis mural, of which that we just finished the mural conservation,… tagged big time! So, why am I glad this happened? We have needed fresh graffiti so we can test our methods for removing it. We’ve got logistics to work out; since we are ready and organized to mobilize when we get a call, we have needed to standardize the way to make the maintenance visits so the whole process can run as smoothly as possible. I’ve needed to test and try different removal methods so we can calculate the costs and time required for removal in order to make the effort more efficient. Hence, my reserved and calm manner as we address this vandalism. 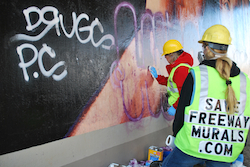 The cleaning-removal of the new graffiti is proving very different than the first cleaning that removed 8 years of accumulated old graffiti (which is how long ago it was cleaned last time according to Caltrans). But I’m sure that the details of those processes would bore you to tears… maybe I already have. We got the call about the new graffiti on Monday. We were “on it” with the removal Tues. morning. We’ll be on it when it happens again. We have lots to talk about as we begin work on other murals and hunt down the anarchist vandals. You can check out our progress at www.savefreewaymurals.com. Sign up for the auto-updates in the upper right corner and please give us a THUMBS UP! Feel free to leave your comments. The bulk of the graffiti removed. 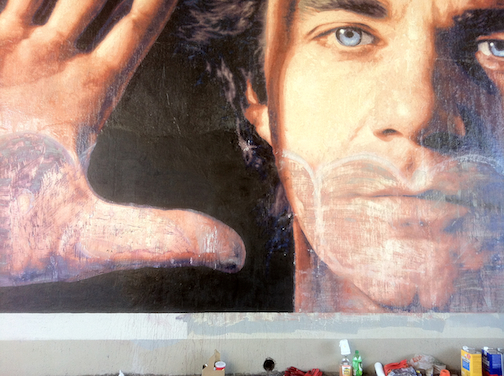 This entry was posted in Murals and tagged Downtown Los Angeles, Graffiti, Kent Twitchell, Mural. Bookmark the permalink. 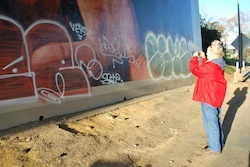 2 Responses to Kent Twitchell’s Morphesis mural, of which that we just finished the mural conservation,… tagged big time! *&%$##@!!(*&^&@$%! Can I say that here? How can someone function in society and family with such an attitude of disrespect towards others? Thanks for all of your work on this effort to keep this public art beautiful and not to succumb to the darkside. I am looking forward to reading more of your posts in the future and following your progress.